Doozydog! Club - Dog Boarding, Dog Un-Kennel, Pet Sitting - Los Angeles, Seattle, San Diego, Silicon Valley, Dallas & Washington, D.C.
Go on a guilt free trip knowing your best friend is having as much fun as you – maybe more! 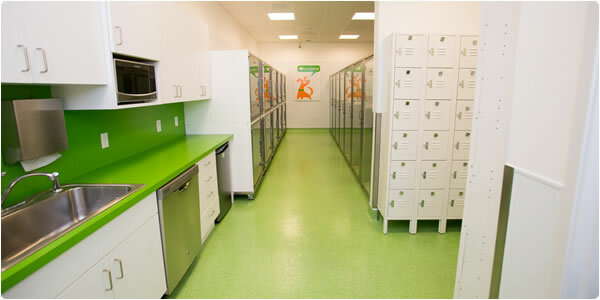 This is not your average boarding kennel. In fact, we don't even like the word kennel because it is more like a home away from home for your dog. It's more like an "un-kennel." Watch your precious pup via our live Doozydog! Webcam. Dogs enjoy a comfortable night’s sleep on veterinarian recommended Kuranda™ beds while dozing off to dreamy chill music. Dogs are never left alone. Our overnight Watchdog! ensures each dog is safe and sound. Doozydog! Club provides award winning Orijen dog food – unmatched quality of any other dog food on earth. We encourage you to bring your own dog grub as most dogs are sensitive to a sudden change in diet. There is no additional charge, so long as each meal is prepared in a separate baggie and labeled by meal, with your dog’s first and last name on it. Doozydog! Club is open for tours during all operating hours. Feel free to bring a friend. See for yourself why we offer the best dog boarding experience for your pet. We take pride in presenting a safe, friendly and sparkling clean environment at all times. Please refrain from bringing your dog to tour until the Meet & Greet.